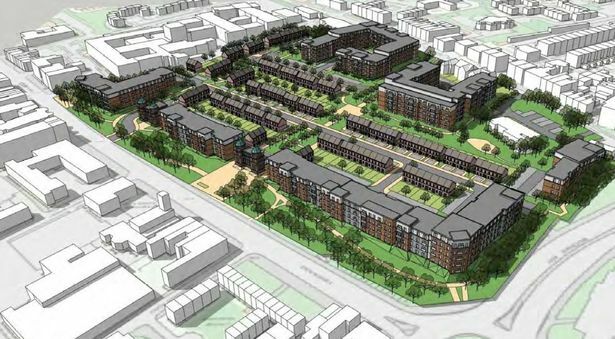 BJD Investors and Developers have submitted plans for a revised Nightingale Quarter on the site of the former Derbyshire Royal Infirmary. After purchasing the site earlier this year, BJD were quick to outline their ambitions for the DRI, focusing on delivery of a high-quality residential neighbourhood. Plans have now been submitted which are expected to be determined at Planning Committee on the 14th February 2019. If successful, work will commence in August 2019, with the first homes available in autumn 2020. Two iconic Pepper Pot buildings still remain on the site and BJD have decided to make both buildings a key feature of the scheme. Other historical features of the site will be refurbished and restored, including the five villas opposite Hartington Street, following constructive consultation with the Conservation Officer. The site is now expected to incorporate close to 800 new homes. Following consultation, BJD have decided against including retail on the site to ensure the Nightingale Quarter adds a sizeable economic benefit to businesses already established in the local area. John Forkin, Managing Director of inward investment agency, Marketing Derby said, "This is an important step in bringing forward development of one of the largest city centre regeneration sites in the country. The Nightingale Quarter will be a desirable residential location in Derby city centre and, providing planning deadlines are met, should be developed at pace. I look forward to seeing this important part of Derby's past becoming a vital community asset for its future too."